Even under duress, advertising remains by far the most critical revenue stream for the U.S. news media as a whole. Legacy media, which for much of the 20th century were the de facto way for advertisers to reach consumers, still command the majority of ad dollars. Daily newspaper advertising—print and digital combined—represents more than half (58%) of all the known advertising revenue tied to journalism, about $25.2 billion according to the Newspaper Association of America (2012 figures).3 Still, the total is only about half of what it was in 2005, when advertising dollars peaked for the newspaper industry at $49 billion (and 82% of total newspaper revenue). 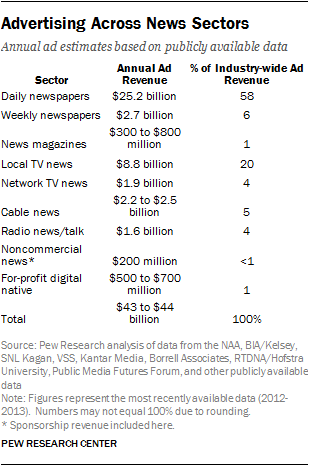 Nearly a third of the total advertising revenue tied to journalism comes from television. Revenues generated by news programming on cable and broadcast, including national and local network affiliates, and their websites, now total roughly $12.8 billion annually with more than two-thirds coming from local TV. That represents 30% of the total news-related ad revenue identified by Pew Research analysts, and includes estimates for digital revenue tied to the legacy product. Another broadcast medium—commercial news and talk radio, which airs the daily programming of hosts such as Rush Limbaugh and Ed Schultz—brought in $1.6 billion in advertising revenue (its primary source of income) in 2012 from 971 such stations, according to BIA/Kelsey. That amounts to 4% of all known news-related ad revenue in the U.S. media landscape. Noncommercial news media—which includes public radio (such as NPR) and nonprofit digital platforms (ProPublica, Texas Tribune) as well as The Associated Press—is a diverse cohort of journalistic organizations bound together, effectively, by a tax status. At this point, advertising and sponsorship amount to about $200 million in a year, making it a small source of revenue for these outlets, and a tiny fraction of the wider news industry advertising. How much advertising revenue is coming from the many digital news startups and entrepreneurial journalism initiatives that have emerged in recent years? This collection of sites—call them the “for-profit digital natives”—are not counted by trade associations as TV stations are, audited as newspapers are, or required to submit 990 government tax forms as public radio stations are. Given the range of operations and models—from high-traffic sites like The Huffington Post to local startups like The Batavian (Genesee County, N.Y.)—there is no simple way to arrange these digitally native news operations into an exhaustive category. The fact that many of these digital brands are private companies that do not typically release their finances publicly adds another layer of complexity. Nevertheless, the available data and deeper inquiry by Pew Research provide some clues. A number of for-profit digital news operations, whose businesses are based largely on advertising, have released their own internal overall revenue figures—$175 million at Vice Media, upwards of $20 million at Business Insider, $10 million to $15 million at Mashable. For other digital news properties, market research firms and financial journalists have estimated annual intake—$100 million at The Huffington Post, $60 million at BuzzFeed, $15 million to $20 million at Gawker, and so on.8 Other attempts have been made to assess the revenues generated by the much longer tail of small, local and hyperlocal digital news outlets. The most in-depth attempt to date—a survey by journalist Michele McLellan—found that among 44 such sites (excluding nonprofits), 2013 revenues amounted to about a combined $5 million. All told, analysts identified roughly $500 million in annual ad revenue for these for-profit digital news outlets.9 The actual intake is almost certainly higher than that, because there are many digital news businesses for which even estimates are unavailable. But even if that figure were doubled, revenue derived from this sector would not amount to any more than 1% to 2% of all news ad revenue accounted for in the U.S. media system. While advertising accounted for most of the revenue identified for this sector, some digital news operations are moving aggressively into other revenue opportunities, such as events and premium subscriptions, described in further detail below. And others have benefited from an influx of venture capital, subsidies from other products within the company and direct owner investment. Ad revenues from legacy news magazines are also difficult to assess, as the standard estimates based on rate card data are known to be heavily inflated. In past analyses, Pew Research has instead relied on number of ad pages to provide a more accurate sense of growth or decline year to year. But to get a sense of even the range of total revenue for this sector, the Center relied on publicly available estimates for specific publications and projected a possible range of about $550 million to $1.4 billion, with the upper limit being an estimate derived from rate card figures.10 And to get a sense of how much of that comes from advertising, we turned to market research firm VSS, which estimates that 59.5% of consumer magazine revenue—which includes news magazines—comes from print and digital advertising.11 Using that estimate, the ad revenue generated from legacy news magazines most likely falls within the $300 million-to-$800 million range. Another print sector—weekly newspapers—generates a majority of its revenue from advertising, according to estimates from research firm SNL Kagan. The firm projects that 76% of weekly newspaper revenue— $2.7 billion—comes from ads. There are three other news media sectors where revenue figures of any kind—let alone advertising estimates—were simply not obtainable: local cable news operations, city and regional magazines, and news organizations geared toward specific ethnic groups. While local cable news outlets—such as NY1 in New York and NECN in New England —are a part of the local TV ecosystem, gathering concrete financial data on these types of stations is a challenge (not even a comprehensive list of such stations was available from the Radio Television Digital News Association, the industry group to which local cable outlets belong). City and regional magazines—such as Washingtonian Magazine or St. Louis Magazine—are also difficult to track. A representative of the City and Regional Magazine Association told Pew Research that these publications are “nonpublic in every sense of the word” and, as such, the association does not track revenue in any systematic fashion. And while some ethnic publications may be included in SNL Kagan’s accounting of weekly newspapers, there are no systematic financial data for this sector as a whole.